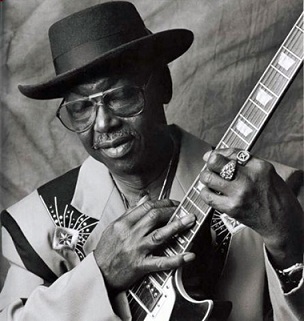 Texas Johnny Brown was born John Riley Brown on February 22, 1928, in Choctaw County, Mississippi. Upon the death of his mother in 1937, Johnny moved to New Orleans to live with his father. One of the more amusing stories about Johnny comes from these early years spent with his father. According to Johnny his father had a dog that played the guitar or should I say, his father would hold the guitar on his knee and make chords while the dog would paw the strings. Johnny would accompany the two on tambourine and vocals and later on guitar. Traveling from town to town the three would play street corners and small clubs for the hat. On one such trip to Natchez, Mississippi, a movie producer saw them perform which resulted in a bit part in the movie "Virginia". In 1944 Johnny struck out on his own, traveling to Alexandria, Louisiana, where he would meet his future wife, Rosie. Johnny landed in Houston in early 1946 and discovered Shady's Playhouse. Here he met folks like Henry Hayes, L.A. Hill, Teddy Reynolds, Buddy Carter, and an array of now famous blues men. It was during this period Miss Ann Cullen gave him the name Texas Johnny Brown. Miss Cullen put a band together with Johnny on guitar, and they begin to travel around the state on the now famous chitlin' circuit. The band later evolved in 1947 into the Aladdin Chicken Shackers marking the beginning of Johnny's career. A national tour followed taking them from California to New York's famed Apollo Theater where he met Lionel Hampton, Willie Herman, Dizzie Gillespie and John Coltrane. Johnny was playing with the "big boys" now, and the dividends from these associations were taking his guitar work to a new level. Returning to Houston in 1950 Johnny married his sweetheart Rosie, enlisted in the military and became a communications expert in the Army's 26th Signal Corp in Korea. Released from his tour of duty in 1953 he returned to Houston and the music. He hooked back up with Amos Milburn and the Aladdin Chicken Shackers, resumed touring and recorded Chicken Shack Boogie, Took a Long Time and Operation Blue. In 1956 he left the band and played with a number of groups until 1957, at which time he began to perform session work for the Duke Peacock record label. Most of these early recordings were with Bobby Bland and Junior Parker and have withstood the test of time becoming true classics. 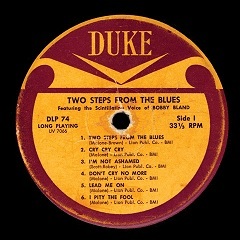 Wishing Well, Further on up the Road and Two Steps From The Blues (Johnny's composition), which became one of Bobby Bland's best selling records. These were years of constant studio work and touring alongside Bobby, Junior, Wayne Bennett, Joe Hinton, Buddy Ace and Clarence Hollimon. Johnny returned from a tour in 1964 and left the label. He continued to play around town in a variety of bands, including John Robinson and The Hurricane Band, The Joy Boys and The Peace and Love Band. In 1970 Johnny packed up his guitar and focused his attention on family and the 8 to 5 grind and woodshedded until 1991. As soon as the kids were grown, the guitar came out of the case once again to play the blues. Johnny hooked up with old friends like Joe "Guitar" Hughes, Grady Gaines, Trudy Lynn and Teddy Reynolds and was invited to play the Vredendurg Utrecht Blues Estafette (festival) in Holland with Pete Mayes. 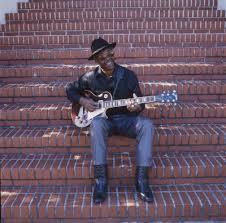 In 1993 Johnny formed The Quality Blues Band to showcase his fifty years worth of material and talent. The band originally included Joe Griffin (drums), John Newsome (bass) and Mr. Dave (keyboards). The band later evolved into Donald "Sweet D" Owens on bass and long-time friend, Teddy "Cry Cry" Reynolds on the keys with Joe remaining on drums. The band entered Sugar Hill Recording Studio in 1995 and recorded Stand the Pain, No Part Time Lover, Strange Situation and Blue and Lonesome as a demo tape for Austin's South By Southwest Expo. Shortly thereafter Teddy Reynolds' failing health forced him to leave the band. Enter Charles Rhinehardt on keyboards, and the band resumed their tour schedule including stops in Paris, Norway and a continuation of studio recording. Charles was instrumental in the initial co-producing of the project, as well as with the horn arrangements. Tragically Charles passed away unexpectedly leaving a void in the ensemble. "Charles' death left me in a state of shock" said Johnny. "He was trying to help me preserve the flavor of the tracks we had already laid down. In the beginning Charles and I went through and put a lot of parts on disc in order to keep the original material as well as the horn parts. Charles wasn't an easy person to replace. I had to find a keyboard player who would keep that same feeling. Iola Broussard came forth for a little bit and helped out and then we got Alvin King, and he was the answer to the whole deal. He played some of the string parts and some of the organ parts. He is a very talented person and we got through it." A tentative offer to sign with Antone’s Records fell through and the decision was made to release Nothin' but the Truth independently on the Choctaw Creek Record label. "It's a good feeling to finally have this CD out. I am pleased with the way it is going. I am getting emails from all over, and it is not the same songs that are getting all the airplay. One of the songs was number one for a week in Holland and in Canada. One was number two or three. The CD has led to a number of gigs including the Poconos Blues Festival, the Chicago Blues Festival and recently a gig in Philadelphia. The CD is in stores and they are moving." Johnny is still shopping the project and hoping to be picked up by a major label in the near future. "We have talked to a few people but really haven't got what we are looking for. I'd like to recoup some of the expenses of production and get some of the other things we need like publicity. I'm trying to get things going but it takes time. I've been doing some writing and trying to get ready for the next project. I've got about six tunes ready to go and I'm going to do at least two or three covers with my own arrangements to them. I want to pick up some old stuff that goes way back. I was waiting to see which song off the CD would take off and that's the way I was going to follow up. So far it has been hard for me to select between them because they are playing them all." 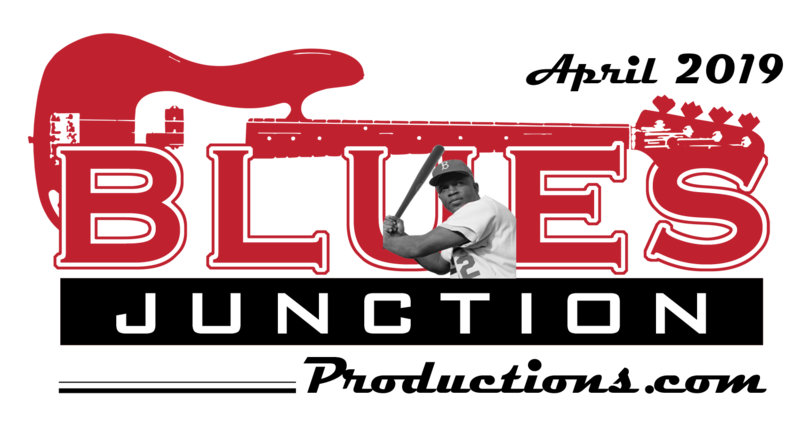 The Quality Blues Band currently consists of Donald "Sweet D" Owens on bass, Kerry Cartwright (drums) and newest member William Hollis on keys. While touring, Giovanni Godley assumes the drum responsibilities. "I would like to say thanks to all my friends out there listening and enjoying my CD. I want to continue to do what I think they like. I hope that I can reach them all the time and be around so we can have a good time. 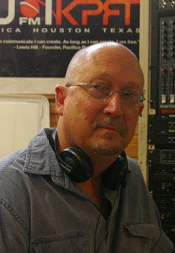 The Houston Blues Society and radio stations, KPFT, KTSU and KCOH, have been very supportive. And you, James, have hung in there all the way. You were there right at the beginning even before we went into Sugar Hill to record. I would also like to thank Rory Miggins from The Local Charm Saloon and Tom McLendon from The Big Easy. I've got quite a few people to be thankful for so if I don't call all their names, I'll touch them somewhere down the road." 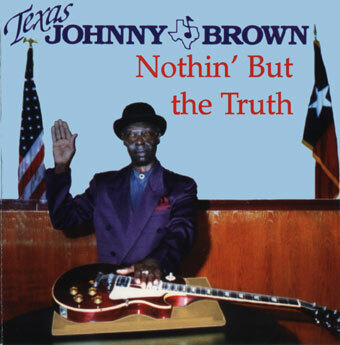 Texas Johnny Brown's new CD, Nothin' but the Truth is exactly that. It is truthful, heartfelt music with enough devotion, diversity and style to catapult him to the ranks of national attention that he rightfully deserves. On behalf of all of us at HBS, I wish him many more years of great music and anxiously await his work to begin on his next endeavor. Since the time of the above article, Texas Johnny Brown continued to flourish as a musician appearing at festivals and shows around the world. His 2001 release, Blues Defender only served to further establish his blues legacy. Even with all these honors his true legacy lay behind his beautiful smile, warm heart and undying love for his family, friends, fans and the music that brought all of us so much joy. A soft-spoken, kind and gentle man, Texas Johnny Brown epitomized all the superlative qualities of the quintessential blues man. With a career that spanned over six decades, he was the consummate showman. His warm, rich vocals, prolific songwriting abilities and world-class guitar work are testament to a seasoned veteran who lived and breathed the blues he played. No doubt about it, if anyone ever rightfully deserved the term "legend", Johnny Brown was that man. Editor's Note: This article was written by James Nagel back in 1998.